The more you study time, the more meaningless the concept, which is a cultural construct, seems. For example, did you know that George Washington was born on Fedruary 11, 1731 and February 22, 1732? It may seem impossible, but it happened thanks to Protestantism! George Washington (1797). Artist: Gilbert Stuart (1755–1828). Source: Wikimedia Commons. Our story of George Washington’s birth years starts with ancient Rome. You may have noticed that the last 4 months of the year (September – December) are named in numerical order, but that their numbering is off from their actual position on the calendar we use today. For example September (septem is Latin for 7) is the 9th month of the year and December (decem is Latin for 10) is the 12th month. This is because in the early days of Rome, long before their Empire was established, the Romans used a lunar calendar of 10 months. The first 5 months were called Martius, Aprilis, Maius and Junius after Greek and Roman gods and the last were named numerically (quintilis was was later named “July” after Julius Caesar and Sextilis was renamed “August” after Augustus, the first Roman emperor). Six of these months had 30 days and four had 31, for a total of 304 days. The remaining 61 days in the solar year fell during winter and were not counted, most likely because they did not matter much to the argricultural society early Rome. Eventually, however, the months of January and February were created, pushing the numerically named months out of their proper order. The addition of these two month also made the Roman year 355 days long. This, of course, was about 10 days short of the true solar year, so every once in a while an intercalary month of 27 or 28 days would be added to the end of February to bring the calendar in syn with the seasons. But it was Roman politicians who controlled the calendar, and they often abused this power to lengthen their own term or shorten the term of a political enemy. Over the course of a few centuries, the Roman calendar fell months out of sync with the changing of the seasons. 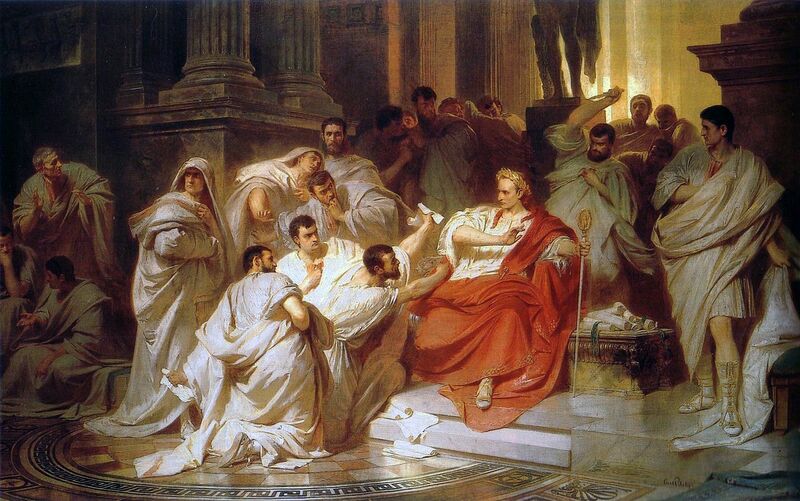 The Murder of Caesar (1865). Artist: Karl von Piloty (1826–1886). Source: Wikimedia Commons. So the Roman year was chaos, at least until Julius Caesar. Caesar introduced the Julian calendar (named after himself) to Rome. Inspired by the 365 day calendar he saw being used in Egypt during his adventures with Cleopatra, Julius Caesar had 10 days added to the Roman calendar, adding them to the end of certain months. Also an extra day was added to February every four years to make up for the fraction of a day discrepancy between the actual solar year and the Julian year. The leap year was invented. This is the same basic calendar structure we use today, minus a small but significant alteration. In Caesar’s day it was known that the solar year is 365.24219 days long, but to make things easier the emperor’s mathematicians rounded up, pretending that the year was 365.25 days long and assuming adding an extra day every four years would be good enough to keep the calendar in sync with sun. This meant that the Julian year was almost 11 minutes longer than the solar year. This discrepancy resulted in a drift of about 3 days every 400 years. In the short term this little discrepancy may not have seemed like much, but over the next 1,500 years it became an issue. By 1582, the Julian calendar was 10 days behind the solar year. This was a big deal to the Catholic Church, because although their calendar was still relatively in sync with the seasons, it was out of sync with observable solar occurrences like vernal and autumnal equinoxes, and it’s the date of the vernal equinox that determines when Easter is celebrated. Therefore, in order to efficiently and accurately plan for Easter feast, a change had to be made. 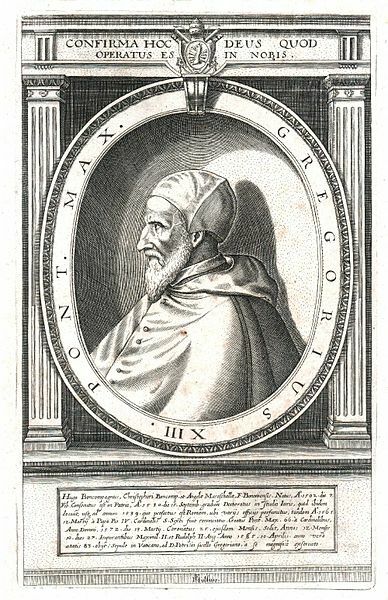 A new calendar was introduced by Pope Gregory XIII in October 1582. The new Gregorian calendar was mostly the same as the Julian calendar, except for leap years. In the Julian Calendar every 4th year is a leap year, but in the Gregorian calendar every year that is exactly divisible by 4 is a leap year, except years that are exactly divisible by 100, unless they are also divisible by 400 in which case they are leap years. Sounds confusing, but its the only way to efficiently make up for the difference in the length of the solar and calendar year. Well, because Protestant nations in Europe, including England, weren’t wild about the Catholics and in particular the Pope, they weren’t very open to changing the way they marked the year according to old Gregory XIII’s whims. England continued to use the Julian calendar until 1752. Also, until the reforms of 1752 the English celebrated New Year on March 25th (the day the archangel Gabriel told Mary she would give birth to Jesus) rather than January 1st. 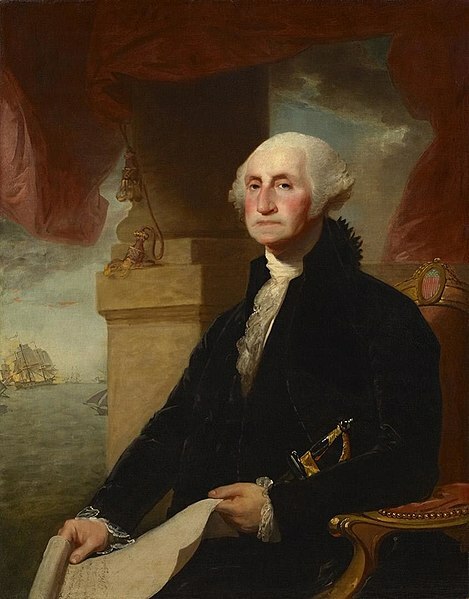 George Washington was born on February 11, 1731, but when Parliament reformed the calendar and made January the start of the year Washington suddenly became a (calendar) year younger! And because the Julian calendar was 11 days behind the solar year by 1752, all dates were moved up 11 days after the reform, making George Washington’s new birthday February 22, 1732. Now that you know all about the history of our calendar, be sure to mark you calendar for all the exciting events and exhibits coming to the Houston Museum of Natural Science this year. Our enormously popular special exhibition Death by Natural Causes leaves soon,so make sure to see it while you can. On February 8th a new special exhibition Biophilia will be opening, this exhibit will be all about the art of nature and will feature real specimens incorporated into art installations. Previous Post What Do Dino's Dream of Doing in 2019?